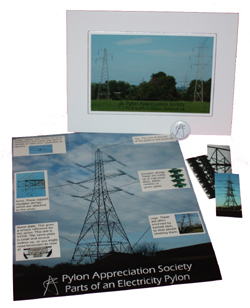 Membership of the Pylon Appreciation Society is £15 for life. It's simple to join: just visit our shop to sign up and begin your subscription. Once notification of your payment is received, you will be sent a card containing details of your username and password so that you can access the members only section. This will come in a welcome pack with a badge, three mini cards, and an 10 x 8 inch print "Parts of a pylon". Simply visit our shop to pay by credit or debit card. Your welcome pack will be sent to the postal address you specify, or if you are a member of Paypal, to the address you have registered with them. Please note, the information provided on this website is mainly based around towers in mainland Britain. Members from other locations are welcome and we will happily send the membership pack around the world, but - unless you wish to contribute to a non-UK section - the information may not relate to your area. Membership is a very popular and unusual gift. To buy, just visit our shop. You will be asked for the recipient's name. If you would like it sent direct to them you can also give their address, otherwise it will be sent to you so you can present it yourself. If you have any specific deadline (for example a birthday) please specify that as well - you should allow 14 days for delivery but if we can send it out sooner we will do. If you prefer to pay by cheque or postal order, please make it payable to Flash Bristow for £15 per member, and then post to 1 Davies Lane, London E11 3DR. Please include your name and address, age if under 16, and if it is a gift, all relevant details of the recipient. If you have any questions about your purchase or membership, please email membership@pylons.org.